Robotic TIG Welding (Short) from WEC Group Ltd on Vimeo. Robotic welding uses computer controlled machines to create a fully automated welding process, during which the robot handles the part and performs the weld. 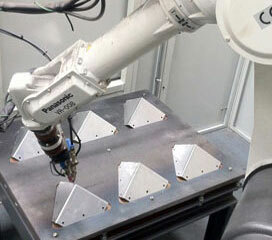 We can use robot welding for 0.5mm - 3mm in mild steel, stainless steel and aluminium.